Can you believe that we’re sitting here on August 1st already? The season is two-thirds gone (wait…weren’t we just entering the “second half” two weeks ago? I keed, I keed.) and despite the Brewers lack of success in posting W’s it still seems to be flying by. This post, however, is intended as the start of a series of items about which Brewers fans and baseball-first fans can still anticipate and appreciate. Today we sit on August 1, exactly one month away from the first topic that brought this series into my mind: September call-ups. However, a codicil kicks in on September 1 whereas any player on the 40-man roster can be active for a Major League game. This period of time, give or take one month calendar month, is utilized in a handful of ways. Contending teams can bring up a couple of specialists to bolster their team. Maybe a pinch-runner or an extra lefty for the bullpen as two examples. For teams like Milwaukee this season, however, the time is often used to get some players a little exposure to big league life, games, clubhouse, travel, etc and to see how they stack up in games against MLB-quality opponents. Many a player has made his debut in “the show” during September. So, back to this season. How does this affect the Brewers? Well, plenty of players have already made their MLB debuts for Milwaukee already this season. Any of those could come back up to finish out the season. There are a number of others who haven’t yet debuted and also a couple of players (like the recently added Rob Wooten, and non-debuted Kyle Heckathorn) who the Brewers need to decide whether to protect from the upcoming Rule 5 Draft. They could add someone to the roster for September to help them arrive at a decision. The Brewers have one spot currently open on the 40-man but could easily open another by moving Mike Fiers to the 60-day DL, for example. The Brewers may also have their hand forced on one spot should Mark Rogers return to health before season’s end. The point being: Doug Melvin has some room to maneuver and get glimpses. That is something to look forward to. After all, given the results this season it’s all about the future at this point. Are Brewers Giving Themselves a Hand? I’m sorry. It’s 1:38am as I’m beginning this post and I just couldn’t resist that headline. There was some Twitter chatter late Saturday night about Donovan Hand having gotten the call to the big leagues to replace injured closer Jim Henderson on the Brewers’ 25-man roster. My best friend is going to the big leagues!!! @donovanhand I’m so proud!!! Should this prove true, it would be a good choice by the Brewers as he has been performing pretty well in Nashville so far this season (2-1, 3.18 ERA, 16 G, 28.1 IP, 32 K, 9 BB) and was the final cut made in camp — in Alfredo Figaro’s favor — down in Arizona. Hand also would provide the length that Roenicke said he would need if they brought up a reliever and started Figaro on Tuedsay. Hand has thrown 3.0 IP in relief on three separate occasions for Nashville already this season, including in his most recent appearance back on May 21st. Though, if it is indeed Hand getting the call then there will need to be a corresponding move on the 40-man roster. Could that be Mark Rogers to the 60-day DL? Would they outright release somebody who hasn’t been performing in Triple-A this season? The only obvious option is Rogers to the 60-day. Though that would, once again, mean a tougher decision would be coming when Corey Hart needs to be added back onto the 40-man roster in a couple of weeks. If you’d like to read up on Hand a little further, here is the profile I did of him for this year’s “Brewers By the (Jersey) Numbers” series back in February. The Brewers confirmed this morning that Donovan Hand did have his contract purchased from the Sounds. Also, as I figured above, Mark Rogers was indeed transferred to the 60-day DL to clear the needed spot on the 40-man roster. The Brewers have announced that both Taylor Green and Mark Rogers have been placed on the 15-day disabled list. Green was placed, retroactive to 3/22, with a left hip labral injury. He played for Team Canada in the World Baseball Classic and started every game (three total) at third base and returned to the Brewers healthy. Until the injury, Green was in competition to start games at first base until the return of injured starter Corey Hart. Mark Rogers was placed on the disabled list, retroactive to 3/25, with right shoulder instability. After maintaining all spring that Rogers was fine despite reduced velocity and control, both sides finally agreed that something must be wrong physically with the oft-injured pitcher. With multiple spots to win open in the rotation to start camp, Rogers was inconsistent at best during his outings. An added benefit to placing Rogers on the DL is that the team can retain him while they attempt to get him right physically. Rogers entered the year out of minor league options. Actual baseball between the Milwaukee Brewers and another team. They’ll play nine innings. They’ll pitch, run, hit, throw, and catch. Hopefully the Brewers will score more runs than the Oakland Athletics but it’s hardly necessary at this stage. As we sit 37 days away from Opening Day on April 1st, the players begin actual competition but more importantly they continue their preparation for the regular season. Mark Elliot Rogers was the Brewers first choice (5th overall) in the 2004 First-Year Player Draft. He has been beleaguered by injuries throughout his professional career. I detailed that injury history in last year’s article, so if you’d like to read it, feel encouraged. Coming into 2012, there wasn’t a job opportunity to be had in the Brewers starting rotation. All five spots were once again spoken for as they returned all five starters from the previous season when they only needed six men total to start all 162 games en route to a division championship and NLCS berth. Rogers entered camp looking to be and stay healthy along with refining his game. Last year at this time I wrote that Rogers might have a chance to win a job in 2013 when up to four positions (behind Yovani Gallardo) could become available. Well, three spots are up for grabs, and one other original rotation member from 2012 returns with Gallardo in Chris Narveson but there is a job to be won. As Rogers enters his age 27 season, the time is now to seize control of his career. Rogers missed the first six games of 2012 as he finished up a suspension but after that he pitched three months of regular starts as a pitcher for the Nashville Sounds. In those 18 starts, the 6’2″ 225 pound right-hander compiled a 6-6 record, 4.72 ERA in 95.1 innings pitched. He walked too many batters (49) and his strikeout rate dropped from his career average, but you could almost think of those first three months of 2012 as one long spring training for Rogers. The process and staying healthy were of the utmost importance. That being said, results certainly still mattered. 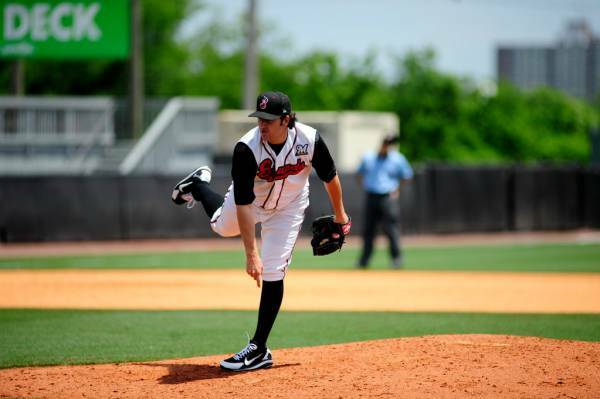 In Rogers final three starts for the Sounds in 2012 his combined totals were 19.0 IP, 2 ER, 9 H, 5 BB, 20 K, 0 HR. Those numbers, along with some fortunate timing, led to Rogers’ being promoted to the big league club at the end of July. The Brewers had just traded away Zack Greinke as it appeared that their season’s destiny was spelled out clearly. With the opening in the rotation and his strong work recently, Mark Rogers was back in the big leagues. In other words, pretty darn good. His K rate was back up to 24.9% and his walk rate settled back down to 8.5%. He finished his big league stint with a 1.282 WHIP, .240 batting average against (.298 BABIP), all resulting in an ERA+ of 106. All told, it was a solid year for Rogers. 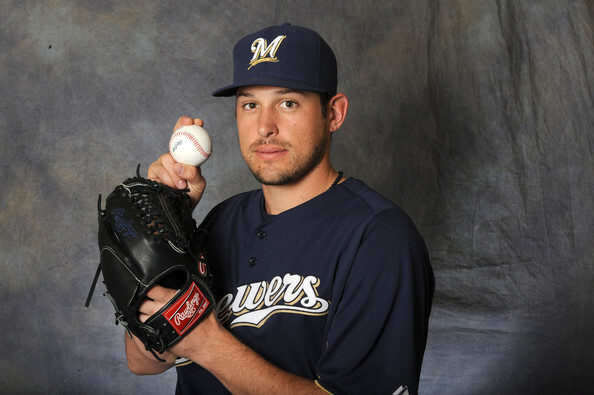 As the 2013 Cactus League gets underway today for the Brewers, Mark Rogers is not scheduled to pitch. He will pitch tomorrow though and he needs to be sharp early. Rogers is out of minor league options finally this year and, as I’m on record as saying, I think he most benefits the Brewers as a member of the starting rotation. Pitching every fifth day while staying on a regimented program between starts should, at least in theory, provide Rogers with the greatest opportunity to stay healthy. Many projection systems don’t have the kindest outlooks on Rogers’ chances this year but the games need to be played. Once upon a time, Rogers was thought of as having a pretty high ceiling. He was projected out of high school to reach the level of a solid #2 pitcher. He can still achieve that level of production if his control doesn’t desert him but at this stage in his career it’s now all about producing on the mound. The future is now. The time has come. You know the phrase “We’ll cross that bridge when we come to it”? Well, the bridge has been come to. Let’s see how Mark Rogers does in crossing it. 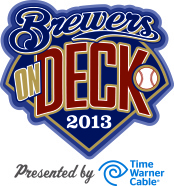 Thirty-two current Milwaukee Brewers players from the 40-man roster plus a host of alumni, Minor League prospects, coaches, front office executives and broadcasters are scheduled to participate in Brewers On Deck, which is set to take place Sunday, January 27 from 10 a.m. – 5 p.m. at the Delta Center. The event is presented by Time Warner Cable. Tickets for Brewers On Deck are currently on sale. Advance tickets are $15 for adults and $9 for children ages 14 and under. Tickets may be purchased at the Miller Park ticket office, by calling the Brewers Ticket office at 414-902-4000, or online at Brewers.com/ondeck. On the day of the event, only cash will be accepted for purchases made at the door. Tickets the day of the event are $20 for adults and $15 for children 14 and under. Brewers On Deck will feature a number of activities for the entire family. Autographs and photos from Brewers players and coaches, interactive games in the Kids Area, Q&A sessions and game shows with coaches, players and staff, vendor booths with baseball memorabilia, the Brewers Community Foundation Treasure Hunt and many other activities will all be a part of Brewers On Deck. The same system for autographs will be used for Brewers On Deck that was used last year. Recipients of any “PREMIER” autographs (players to be announced at a later date) will be chosen through a random selection process. Numbered coupons to be entered into the random selection process will be available the day of the event only and will be distributed beginning at 8 a.m. at the Delta Center. Coupon distribution will be available up to an hour before each designated autograph session. A schedule of players, their session times, and distribution info will be posted later this month. Fans can receive one coupon per event admission ticket and can use that coupon to enter the random selection process for any one of the select Brewers players. There is no cost for coupons to enter the random selection process; however, those holding coupons that are chosen must pay $25 at the respective autograph stage to collect their player signature. There will be 250 winners for each of the PREMIER autograph sessions. Players and staff not included in the PREMIER autograph list will not use the random selection process. Each of these players will sign 250 autographs at prices ranging from free to $10. The autograph opportunities are for signatures on photo cards provided by the team; the Brewers cannot guarantee that any player will sign other memorabilia. For additional information regarding the lottery process, visit Brewers.com/ondeck. All autograph proceeds benefit Brewers Community Foundation. Please note that cash is the only acceptable form of payment for autographs. The Brewers cannot guarantee that any player will sign other memorabilia, and personalization of items is solely up to the discretion of each player. It’s the final day of 2012. This was a year which saw the Milwaukee Brewers attempt (unsuccessfully) to defend a division championship for the first time since 1983. It was the first time that the Brewers featured their very own defending league Most Valuable Player since 1990. They entered the season with an intact rotation which used the fewest different arms (6) to make all 162 starts. Arguably the league’s most fearsome bullpen back-end was returning as well with only a couple of key veterans taking jobs elsewhere. And sure, Prince Fielder followed the money to Detroit but this was going to be Mat Gamel’s breakout year and Aramis Ramirez would pick up most of the slack…at least once May rolled around, he would. Alas, we all know how things turned out in 2012 so I shan’t recap the trials, tribulations, trade, and triumphs that resulted in 83 victories a year after winning a franchise-record 96 games. No, for this column we look forward. We look forward to 2013. We look forward to P&C. We look much too far forward to Opening Day with this set of projections. I’d be extremely happy that I wouldn’t have to still be counting down to Opening Day (91 days as of this writing). I’d be extremely cold while tailgating outside of Miller Park for a few hours on my wife’s birthday. I’d have failed miserably in posting my season preview “Brewers By the Jersey Numbers” articles. But really, I’m posting today to take a look at how the current roster stacks up and what I think a 25-man roster would look like when the games started counting. I gotta tell you all that I would normally not make this projection for quite some time but with Doug Melvin’s declaration that they were “coming to the end” of acquiring free agents (or however he exactly worded it), chances are the majority of options at the team’s disposal today are going to be the same options they are presented with in 43 days when Pitchers and Catchers officially report. Of course, and it should go without needing to be said, a ton can change between now and then anyway despite appearances. Somebody could be traded. Somebody could be signed as a veteran backup where currently only inexperience resides. Somebody could injure themselves in a pickup basketball game. Et cetera. But if we accounted for every “if” that we could, nobody would ever project anything. That’s simply not much fun. I know what you’re thinking. “Free Wily Peralta!” I agree that he’s likely one of the best five options available to fill a spot in the rotation but based on the necessary evil of depth maintenance and with respect to the rules on minor league options, this just feels like the rotation that will head north from Arizona. Gallardo is a lock. Estrada was mentioned more than once this off-season as having an advantage in the competition. (He also isn’t hurt by the fact that his manager really likes his pitching.) Fiers did more than enough throughout most the season to be given a shot from the get. After adding two left-handed relievers to the bullpen, sticking Narveson in there doesn’t make sense anymore (if it ever did). Rogers is out of options and I really want to see him get a shot to contribute as a starting pitcher. He won’t make it through waivers to Nashville. Peralta has options remaining and that’s what this should come down to. Don’t doubt for a minute though that if Fiers struggles for a few starts early and it appears that the end of 2012 was due to being “figured out” more so than simply fatigue, he’ll be optioned down to Nashville in favor of the young Dominican. Tyler Thornburg will get a look this spring but I feel like they don’t want to mess with him as a reliever this year at all. They’ll give him a full season starting in Triple-A. Hopefully with the regular and steady work he was used to, he’ll be able to avoid the arm fatigue that slowed his development in 2012. Hiram Burgos, just added to the 40-man roster, should also pitch in games in big league camp to start the spring, but after skyrocketing through the system this year, he’ll be in Nashville’s rotation when camp breaks. One open spot for competition. Many feel that the aforementioned Peralta should be in the rotation and that either Narveson or Rogers will become the default long reliever as a effect. For me, the final spot in the ‘pen will come down to one of the recent high-ceiling additions which Melvin and his staff have picked up this off-season. If I had my druthers, Michael Olmsted gets first crack at it. Spring Training performance might dictate that he isn’t ready for the jump over Triple-A, and this might be specifically adjusted in March, but based on minor league numbers, projectability, and stuff, Olmsted appears to be at the top of the influx of opportunity-seekers. Olmsted is already on the 40-man roster too, something that would come into play should someone like a Jairo Asencio continue to impress. Last year’s swingman Josh Stinson has an option remaining so he’ll head to the minors. Likewise Miguel De Los Santos. One other note, as of this posting the Mike Gonzalez deal still hadn’t been made official. When it is, someone must come off the 40-man roster. I think that will be Fautino De Los Santos. So, if he’s even still with the organization, he’ll be tucked away in the minors to begin the year. Need there be a lengthy explanation? How’s this: no other catchers on the 40-man; these two played very well all year (when healthy); next best options coming to camp are Blake Lalli and Dayton Buller. Next! A “traditional” roster usually consists of six infielders and five outfielders. I’ve split this roster differently for a couple of reasons though. First, Mat Gamel and Jeff Bianchi are both out of minor league options. Bianchi performed okay last year in his first big league action, but really what the Brewers will be holding onto is depth at shortstop. Sure, they wouldn’t have to add Donnie Murphy to the 40-man roster at all and could just stash him in the minors to begin the year but he is the superior defender to Bianchi and can more capably cover defensively at the hot corner. Furthermore, the team has made no secret of the designs to have Gamel play in the corner outfield spots this spring along with Corey Hart’s obvious ability to fill in should an emergency arise. Taylor Green will once again be the victim of circumstance, but he is more valuable to the organization playing everyday anyway even if that’s at Nashville. He can stay ready at the plate and be called upon if an injury creates a need. To elaborate a bit on my point from above, Logan Schafer can play all three defensive outfield positions very well. He can take over for any of the regulars when they need a day off and can be utilized in double-switches late in games. It’d be the same way that the Brewers played the majority of 2012 defensively once Hart moved to first base. Assuming that day’s starting outfield was Braun-Gomez-Aoki, Nyjer Morgan was the only “true” outfielder remaining on the roster. Schafer can do more than Morgan could defensively and still brings at least as much at the plate from the same left side. For the record, if the Brewers did decide to carry five outfielders, I’d guess that Murphy would begin the season in the minors for depth and the extra outfielder would be Caleb Gindl. This seven IFs and four OFs configuration can work, though, with the proper personnel. The Brewers would have that group in 2013 should they choose to go that route. I would. On Opening Day I foresee manager Ron Roenicke looking to do a couple of things with his lineup. I think he’d like to have Weeks back up near the top and despite how Aoki performed so well while leading off in 2012 I think he’ll play the same card he did once he moved Weeks down the lineup last year to justify the order I have listed. You may recall that on days when Carlos Gomez started in center, Aoki batted second because Aoki handled the bat better to move the leadoff hitter over should he reach base. When Morgan started in center Roenicke felt that Aoki’s patience resulted in a better chance to get on base for the rest of the lineup. As we know, despite typically low batting averages, Weeks gets on base. His .350 career OBP is 99 points higher than his career batting average and only .005 lower than what Aoki did in his rookie season. What’s more, despite the struggles Weeks had for a majority of 2012, he still managed to walk 74 times (and reached based 13 more times after being hit by a pitch). That being the situation near the top, I think it affords Roenicke the opportunity to begin with Gomez further down the order where he won’t hurt the Brewers early on in the season should he regress from last year’s breakout. If Gomez proves that 2012 is the baseline going forward then Roenicke will have a good problem with which to deal. Segura is still young, still growing into his skills and performed well enough in the oft-dreaded “spot before the pitcher” that he could flourish there to begin the year. His winter league numbers are also encouraging regardless of the competition level. If he can develop more patience, he’ll be contributing plenty out of the 8th spot all season. So that’s how I see things shaking out if the season started tomorrow.